Whether you are planning a Caribbean getaway where snorkelling coral reefs will be on the itinerary, or you just want to get better photos of your kids in the pool – at some point the photographer in you is going to demand a shot that can only be achieved by getting IN the water with your camera. If you have ever checked out prices for underwater housings for your DSLR, you probably had a heart attack and died on the spot. The bad new is, if you want to make a career out of underwater photography, you're probably going to have to bite the bullet and pay more for a housing than you did for the camera. The good news is if you just want to try out underwater photography for fun, there are a number of options that will get you started without breaking the bank. From lowest cost to highest, here are some of your options for getting started in underwater photography. Please note that neither I nor Improve Photography LLC take any responsibility for damaged equipment that results from your use of any of these products. They all involve putting your valuable electronics underwater and they are all breakable, tearable, capable of having manufacturer defects or being damaged by careless storage. You should always test them before use and ideally use them with older, backup equipment, not your current “baby”. You will have to assess your own tolerance level for risk, mine is admittedly pretty high, if yours is not then some of these options may not be suitable for you. Please note that neither I nor Improve Photography LLC take any responsibility for damaged equipment that results from your use of any of these products. They all involve putting your valuable electronics underwater and they are all breakable, tearable, capable of having manufacturer defects or being damaged by careless storage. You should always test them before use and ideally use them with older, backup equipment, not your current “baby”. You will have to assess your own tolerance level for risk, mine is admittedly pretty high, if yours is not then some of these options may not be suitable for you. 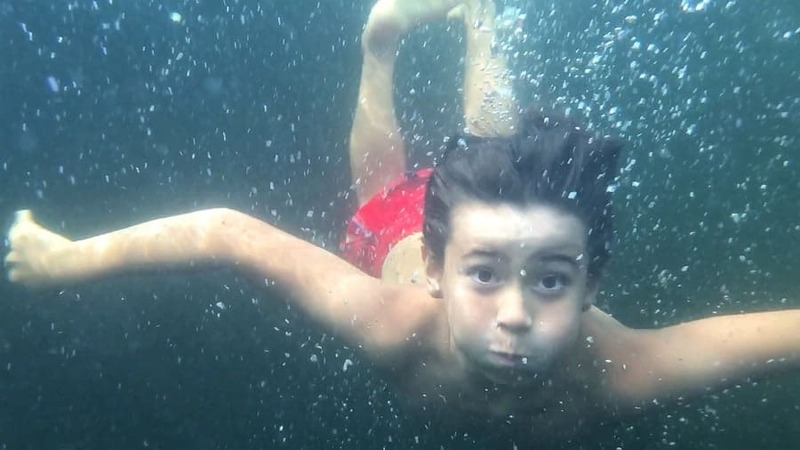 This young man usually runs screaming if anyone points a camera at him, but he was willing to let me take underwater photos and videos all day long. 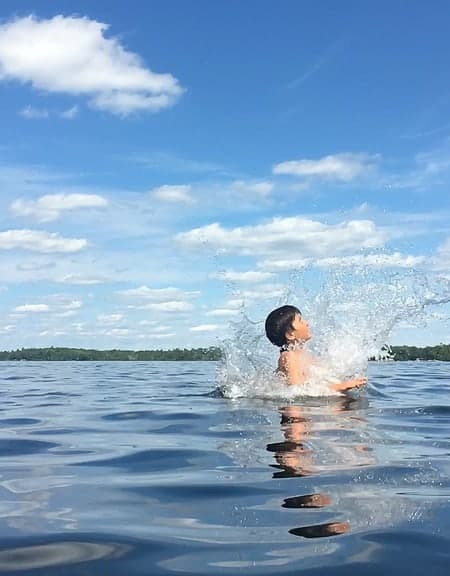 In fact, at one point he said that he was cold and wanted to get out, but that we had to take one more slo-mo video of him doing a super funny dive first. This option is so simple and affordable, I would recommend it even if you are planning to buy more expensive underwater gear for your DSLR. You can get an underwater pouch for your cell phone, and they only cost a few dollars on Amazon. and all of your online sharing options. If taking high-resolution slow-motion video is an option on your cell phone camera, you may even be able to pull some useable stills from the video. This may be necessary because of the biggest downfall of the underwater pouches – the touchscreen won't work as soon as it's submerged. For that reason, I found it most effective to start slow motion video and then put the camera phone underwater while recording. One reason that I suggest slow motion video (besides awesomeness) is that the faster frame rate equates to faster shutter speeds (although it may come at the price of a reduction in resolution). Regular video is 24-30 frames per second, that means shutter speeds of 1/24th to 1/30th of a second, not great for action. By taking slow motion videos, you increase the frame rate to 120-240 fps, which means your shutter speed must be at least 1/120th to 1/240th of a second – still not ideal, but an improvement. You can use your volume buttons as a shutter release, but I found this difﬁcult in the pouch that I have because it is quite thick at the edges and it is hard to press those buttons while keeping the camera relatively still and, you know, trying not to drown and stuff. The pouch that I have is this one, there are dozens of them by different names and various prices, but they all look identical. I deﬁnitely recommend testing the pouch ﬁrst, to make sure that it is indeed waterproof, because who knows how ﬂawed the manufacturing, storage and shipping processes are for such a cheap item. I ordered two of them and they were both ﬁne. With any of these products, some condensation may occur inside the bag, because it will probably be hot outside and much cooler in the water. I put a folded up paper towel inside the pouch, just to help absorb any condensation or leaks. I don't know if it is really effective, but it makes me feel better. 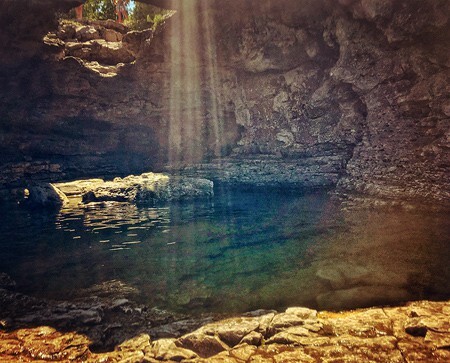 The only way to get a photo of this grotto, from this angle is from in the icy cold waters of Georgian Bay. The only way to get to the spot is by swimming. Am I going to be selling any large prints of this photo? Nope, but I like it, I'm glad I had a camera with me and it went over pretty well on Instagram. Sometimes, it doesn't have to be perfect, fun is reason enough. Leap of faith required to trust a device that may cost $1000+ to replace and contains basically your whole life to a cheaply made $6 pouch. I felt much more confident about taking my iPhone 6s into the water encased in this heavy beast than I did with the cheap pouch. There are a couple of options in this category. 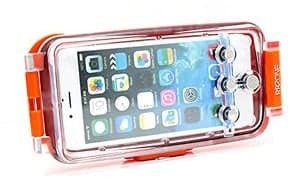 One is the Lifeproof case (link to Amazon), which is meant to be kept on your phone all the time to protect it from water, dust, scratches and falls. It is shockproof for drops of 6.6 feet (2 metres) and can be submerged underwater at the same depth for up to an hour. This means that it would be ﬁne for snorkelling, but not for scuba diving. I have not personally used this case, but I am told that the touch screen DOES work underwater, which is a major bonus. Still, there are a few reasons that this case was not my ﬁrst choice, outlined below. The other hard case option, the one that I chose is not without its ﬂaws, either. I purchased this type of case, which has a much better depth rating and comes with a wrist strap. This design has buttons that you press to work the shutter, so it will work even deep underwater. The drawback is that there is NO touchscreen use, even if you are above the water, so you have to open the app you want to use BEFORE you put the phone in the case and set your phone to never go to sleep. You will only have the ability to operate your “home” button and three features across the bottom row of apps, your “dock” row. Because there are 3 buttons, but 4 apps in this row, you will only have access to the outer two apps, besides the one you have open when you put the camera in the case. If you are using a camera app other than the native camera on your phone, you must make sure that the shutter release is covered by one of those buttons on the case. Once you are in the camera app, there is no way to ﬂip between stills and video, so you will have to make that choice ahead of time and stick with it. Has a thread for an external ﬁsheye or macro lens, which seems like a “pro”, but I cannot for the life of me figure out where or how to purchase these lenses. If you know, please enlighten me! No touchscreen ability at all, so can't switch between apps or even between video and stills once in the camera app. *There is a workaround for this, which is to place your phone camera app on one end of your dock (the bottom row of apps that doesn't move when you change screens), where it can be accessed by one of the 3 buttons and set it to video or slo-mo, as desired. Then, place another camera app (I use Camera+, but it could be whichever camera app you prefer) on the other side of the dock. Now, you can use the plunger buttons to switch back and forth between the apps for video or stills. If you are using camera or video apps other than the native one, make sure that the shutter button is in the centre at the bottom so that it is covered by the button on the case. Your phone should be well charged because leaving the camera open constantly will drain battery life, as will having the screen turned up as bright as possible (recommended). The cold water may additionally decrease battery life. If your phone pops up a low battery alert at 20% or 10%, guess what? No touchscreen means you can't turn it off and will have to get out of the water, dry off the case and open it to tap the screen. Doh. 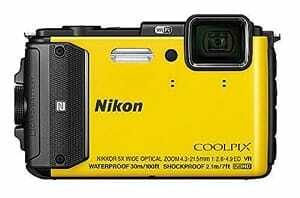 The Nikon Coolpix AW130 is a popular underwater point and shoot. This is my least favourite of the options, just because I don't really feel like I need yet another device to lug around, however it could be the best option for those who don't dare to risk their equipment with underwater bags or housings. If your alternative is not to be able to take photos from the water at all, then pick up one of these relatively inexpensive little numbers for your next vacation. As photographers, we are always looking for novel angles and viewpoints and even taking a photo back towards the shore from in the water is a different point of view than most photos of that location will have. Another important consideration is that waterproof also means weatherproof and usually dustproof as well. Having some sort of underwater gear means that you can feel safe in bringing your camera out when skiing, hanging at the beach, swimming, hiking on a rainy day or just about any other extreme and electronics-unfriendly environment you can think of. Many years ago, I went on a trip to Peru and the Galapagos Islands. Thankfully, I bought a cheap underwater point and shoot to take with me because at the time, in my whole group, only one other person had an underwater camera so everyone ended up relying on the two of us for underwater photos and videos while we swam with playful sea lions and unconcerned sea turtles. 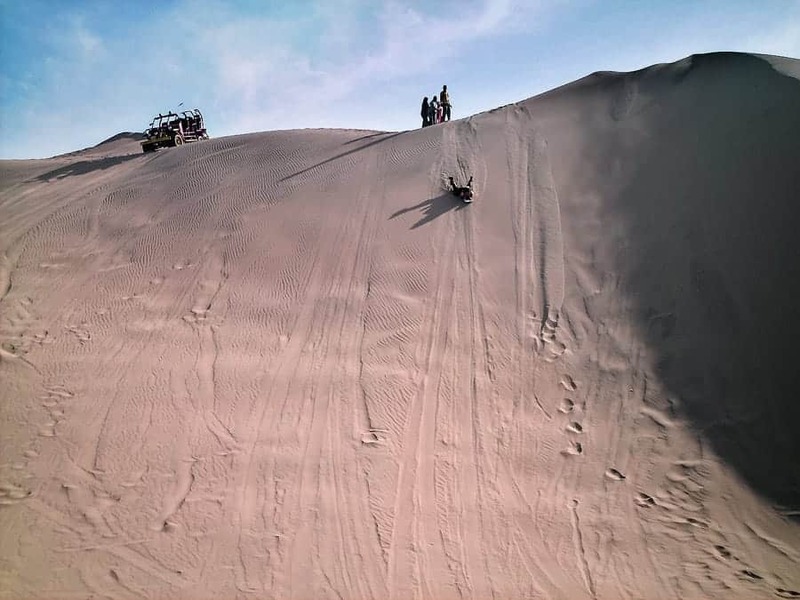 That was the reason that I bought the camera, but I also ended up using it in Peru, while hiking in a torrential downpour in the rainforest and again in the desert when we went sand boarding. I would have missed a lot of awesome photo opportunities if I hadn't brought that waterproof camera along. Some popular options are the Olympus Tough TG4 and Nikon Coolpix AW130. Please note that I have not used either of these cameras myself, they just kept coming up as I was researching underwater cameras for my personal use and they have good ratings on Amazon. I personally decided to go with the phone cases and an underwater bag for my DSLR, which I will review later on its own. 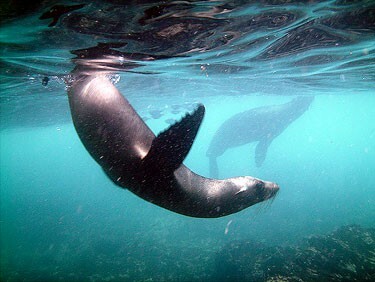 When you're snorkelling with playful, curious Sea Lions in the Galapagos Islands, a cheap 5MP underwater camera is better than having no photos at all. Ugh, who wants another device to carry? On the other hand, most point and shoots these days are no bigger and heavier than the iPhone dive case mentioned above and will certainly take up less space in your bag than a DSLR underwater bag or housing. Though less costly than most of us are accustomed to for camera gear, this is still the most expensive option that I am discussing in this article. Obviously, this is not a comprehensive list of options, I just want to put the idea out there that the cost barrier to having fun with underwater photography can be quite low. One glaring omission in this article is underwater bags and pouches for your DSLR or mirrorless camera. If you have as much fun experimenting with underwater photography as I have had in researching this article, then you will certainly start longing for the control and clarity that you can only get from your “real” camera. Never fear, I have a review in the works, underwater DSLR photography has a bit of a learning curve and it has demanded an article of its own! Sandboarding is not a super camera friendly activity.